This extension comes with 1 bundle. Popular Ombre hair weave extensions are made with 100% real Brazilian virgin hair, the color shifts from #1b to grey, a very bold Ombre hair weave for girls who want to get a striking look on the coming Halloween and Christmas Festival. Now our store just welcomes a lot of new Ombre hair extensions, choose the one you favor most. The color of the hair you receive will probably has some difference with the one you see on our store, but that's very normal because it is the reason of monitor resolution. The silver grey hair looks very good and feels perfectly silky, the T1B color on the root of the hair looks natural, there is also no bad smell on the hair, the straight grey hair can be dyed into a darker color, or being bleached to #613, you can also use special tools to curl so that get beautiful waves. With this hair, you can do any process on it just like your natural hair. This hair is awesome! I just received it today. I will update once it is in installed! Very soft, no smell and no shedding when running my fingers through it. And I will be ordering more! Love it and for a GREAT PRICE! 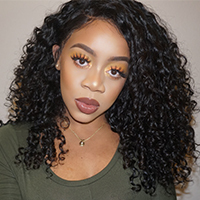 The best hair ever Review by Paige M.
Bundles are nice full and soft, love it always and this is my second purchase from new star. nice grey hair Review by Mia C.
I LOVEEEDDD this hair!!! I received the hair after 3 days from ordering it online! The seller was very kind sent me messages and called me to make sure I received the hair.